Arnhem, Netherlands, September 2017 - Icttrainingen.nl named the first official Dutch provider of EC-Council online security training. The past year has seen major cyber security breaches among even the most secured organizations in the world. From general phishing attacks to simply DDoS attacks to sophisticated malware attacks, the world seems to be under attack at all times. So, how can we ensure a safe cyber world tomorrow? To further that conversation, Dagang NeXchange (DNeX) has announced their 2nd Annual Cyber Security Conference, which is to be held from Nov 16, 2017 – Nov 18, 2017 in Bukit Tinggi, Malaysia. 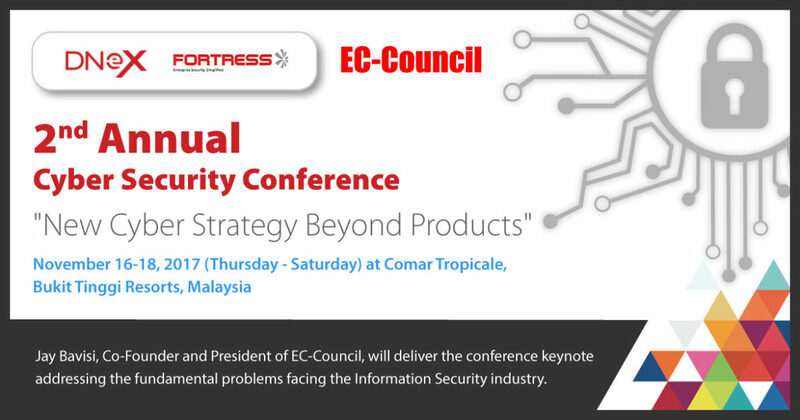 The conference will focus on “New Cyber Security Beyond Products” and address the pressing issues of reducing risks through cyber exposure, SIEM’s place in cyber security warfare, cyber insurance in Malaysia, and the future of digital transformation. The three-day event will host experts who will share their thoughts on the situation at present, and what can and ought to be done to improve cyber security. These entrepreneurs, visionaries, and decision makers come from diverse industries and will be sharing new ideas, insights, and solutions to the various challenges faced by the cyber world. Keynote speaker, Jay Bavisi, CEO, EC-Council Group and Chairman of the Board, EC-Council University, an international leader in cyber security training, certification, and education, will be sharing his views and ideas on combatting cyber security challenges that have been faced over the year and those that are yet to come. This event will also feature speakers from SecureKi, V-Key, Micro Focus Arcsight, Cypod, Tenable, FireEye, and A10 Networks. EC-Council has been the world’s leading information security certification body since the launch of their flagship program, Certified Ethical Hacker (CEH), which created the ethical hacking industry in 2002. Since the launch of CEH, EC-Council has added industry-leading programs to their portfolio to cover all aspects of information security, including EC-Council Certified Security Analyst (ECSA), Computer Hacking Forensics Investigator (CHFI), Certified Chief Information Security Officer (CCISO), among others. EC-Council Foundation, the non-profit branch of EC-Council, created Global CyberLympics, the world’s first global hacking competition. EC-Council Foundation also hosts a suite of conferences across the US and around the world, including Hacker Halted, Global CISO Forum, TakeDownCon, and CISO Summit.